The new Inspire Pharmacy Website is an eCommerce+ package combining the existing Inspire Pharmacy logo and branding. 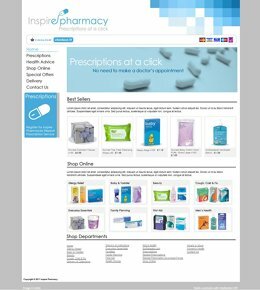 Created to promote Inspire Pharmacies Prescription offer across NHS and Private Prescriptions as well as providing a wide selection of health and beauty products available to buy online. Inspire Pharmacy includes 'Ask a Pharmacist', allowing customers to complete an online form and request a call back from the comfort of there own home and an easy to use 'A-Z Health Advice' section.